“Irasshaimase!” yells chef Sun Hong as you take a seat at one of only eight stools at By Tae—delivering this welcome in the guttural way in which customers are commonly welcomed at Japanese restaurants and shops. At his micro-restaurant, tucked into a back hallway in Chophouse Row (Capitol Hill, 1424 11th Ave.; Instagram, @bytaeseattle), Hong offers only one thing for sit-down diners: a trio of hand rolls, which resemble an uncut sushi roll and are meant to be eaten quickly while the nori wrapper is still crunchy. 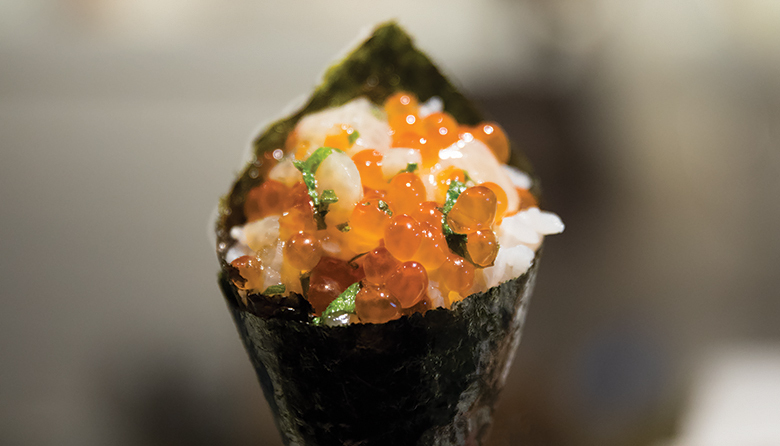 The rolls feature the freshest fish, such as buttery chopped albacore bright with yuzu kosho, or scallop sweetened by freshly grated Asian pear and speckled with salty salmon ikura ($25 for three, subject to change, depending on what’s fresh). Hong is as personable as he is talented in the kitchen, making lunch here as enjoyable as any omakase.